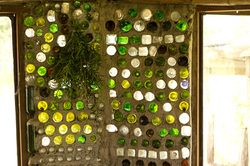 Welcome to my website and my bottle can hut, the first I think in Zimbabwe. The hut is built from recycled bottles, cans, and scrap metal and symbolically represents my dedication to recycling and respecting the Earth and all her life. The hut is also my workshop where I am able to create and process herbs, fabrics and paper. These three business employ a dozen people, and fund a pre school. And hopefully soon a creche, six of us have had a baby last year. Explore our website to find out about all our products and please feel free to contact us.